Since it is that time of year when many babies are born, statistically speaking, we might as well speak of sleeping. Sleep is a critical element to our health and wellbeing. 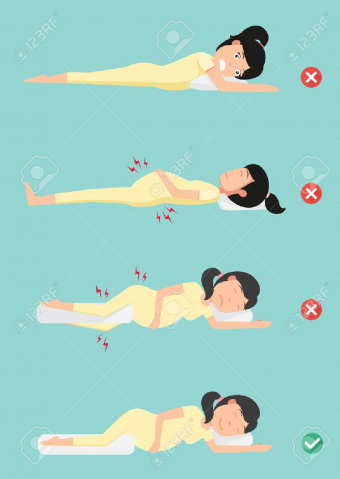 It is only fitting that we discuss the difficulties during pregnancy, particularly the final trimester, in finding a 'good' and effective sleep position. It’s generally never that easy to fall asleep, but when you’re pregnant and have a watermelon of a stomach to consider, it can get tough to get comfortable … Here are a few suggestions to best benefit your sleep and the child’s health. It is important to note that a few factors may inhibit your comfort and sleep, such as back pain, insomnia, heartburn, increased size of the abdomen, etc. Your body is faced with many changes, consider these sleeping positions in order to aid ease these factors of disrupted sleep and make it more comfortable. Best position tends to be sleeping on your side. Sleeping on your side, particularily on the left(according to the American pregnancy association), increases the amount of blood and nutrients that will make their way to the placenta and your baby. With bent knees and legs, place a pillow between the knees in order to align the back and hips, also reducing pressure points and pains. Which positions are less desirable, or harmful? Because it may cause backaches; haemorrhoids; problems with the digestive system; or decreases in circulation to your heart and to the baby. This results due to your increased abdomen size and weight on your intestines and blood vessels. Well, with a large abdomen it can make this position difficult to get into, but also not ideal for the safety of your baby. Use under your belly in side lying, for any back pain or abdominal wall “pulling” sensations. Note: there are wedge pillows specially designed for this. Use between your knees for alignment. Use behind your back for comfort, and to reduce rolling onto your back. Use one to prop yourself (head/upper body) up if you suffer from heartburn. This keeps gravity drawing the contents downward to the stomach and reduce the chance of backflow up to the esophagus and mouth. Do not be alarmed if you wake up on your back, just turn back to your side and enjoy your rest.